Eating disorders (ED) have been reported to be on the increase among Indians, particularly among adolescent and young adult females.,, Surveys of ED since 1995 from India reports of increasing incidences and prevalence through indirect surveys, hospital-based studies, and case reports.,,,,,,, India is reported to be in a phase of change in its dietary pattern fuelled by economic changes, rapid urbanization, increased women's participation in the workforce, the effect of globalization, and targeted advertisements. These phenomenon are often accompanied by shift of diet from traditional balanced to carbohydrate-rich western diet. It is reported that the concept of “thin body” is promoted among urban, girls through mass media that may lead to dissatisfaction to their body weight. Such a negative feeling may precipitate to disordered eating behavior or ED. 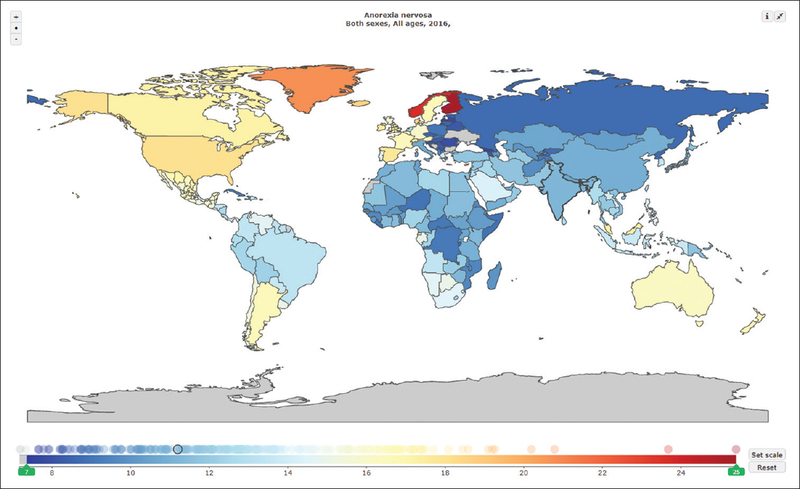 The Global Burden of Diseases (GBD) is a unique attempt to bring in all available quality, peer-reviewed literature to predict the epidemiological parameters of prevalence, death, and disability-adjusted life years (DALY). A DALY is described as the number of productive years lost due to ill-health, disability or early death due to disease. The GBD relies on the power of mathematical modeling using advanced computation using DisMod-MR 2.1.16 (Disease Modeling Meta-Regression Tool-2, free tool, Jan Barendregt, Department of Public Health of Erasmus University, Netherlands, Available from www. epigear. com). The aim of this manuscript is to provide a comprehensive analysis and mathematical modeling using available parameters for AN for India in 2016 to evolve a robust estimate for the AN that as of this day is not reported. All relevant publications meeting GBD quality, from 1980 to 2016 were used to collect the data. In case of non-availability of data GBD methodology, applies a non-linear mixed effect model that employs the relationship between key covariates of the diseases and its associated rates, spatiotemporal regression, and Gaussian process regression. GBD makes such predictions in cases where there are no or little-observed data by borrowing strength from the past data or with that of the pertinent neighboring countries that have empirical data. Prevalence were the estimate number of patients with AN and DALYs, is described as “a year of healthy life lost due to either premature mortality or disability” and the sum of DALYs as “the gap between the population's current health status and an ideal situation where the entire population lives to an advanced age, free of disease.” Relative risk (expressed as a rate ratio) was the mortality rate in the diseased compared to the mortality rate in the nondiseased population. In this study, a corresponding appropriate GBD disability weight derived from a population survey is applied. This method ensures that disease burden is a function of public perception about disease severity rather than the interpretation of the healthcare personnel. The disability weight for AN (95% confidence interval was 0.224 (0.150–0.312). 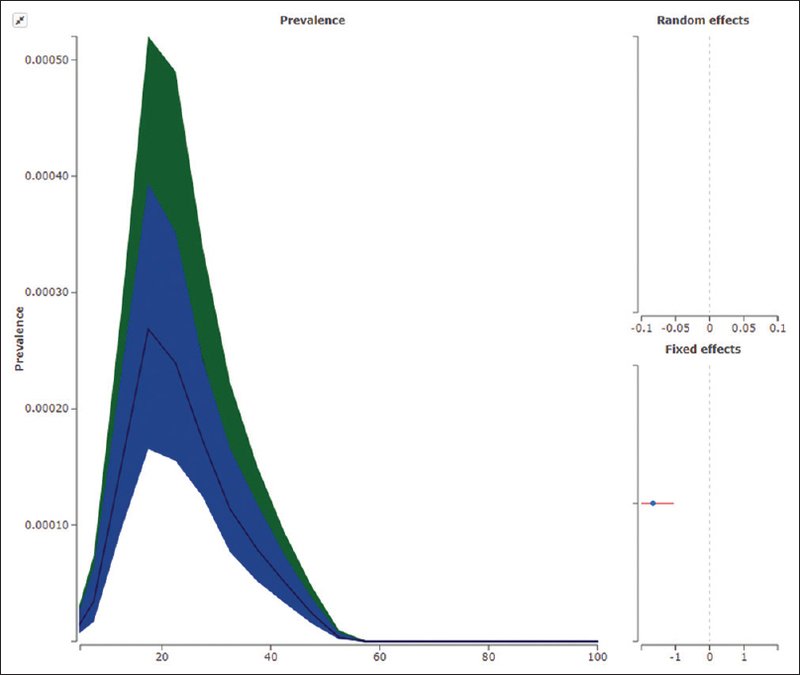 GBD epidemiological visualization applies a log rate model of AN prevalence, incidence, remission, and case-fatality rates and fits models with a randomized Markov-Chain Monte Carlo algorithm. This model accounts for all possible outcomes and its probabilities, then incrementally performing risk analysis. The model accounts for the fixed and random factors, including mortality. The statistical calculation model of GBD exhibits the significant effects both in coefficient and exponentiated coefficient, which can be considered as odds ratio. From the interactive map option, age-standardized rates of incidence and remission with 95% UI for either gender for all AN listed were obtained. We employed the “country final” option which represents estimate for India (blue) and “global final” (green) to compare. Global final is the final estimate fit to all the world's data after accounting for all covariates. There was no large-scale literature in support of the AN in India. GBD utilized the South Asia level 135 sources of survey and literature from which 155 data points were drawn to calculate the model [Supplementary File 1]. The small-scale references published did not meet the requirements of GBD data source.,,,,,,,,,, This is major limitation. However, the data available with few published literature coincide with the GBD scores obtained. Using the South Asian prevalence to estimate the Indian prevalence is warranted to have a robust estimate of the AN prevalence and its characteristics. The prevalence of AN was calculated to be at 332906.6 with a female predominance over a male by a ratio of 3.871. The incidence rate per 100,000 projected at a global level is given in [Figure 1] and prevalence rate per 100,000 is given in [Figure 2]. The prevalence rate of AN for males was 10/100,000 while for females, it was 37.2 and combined gender burden was 22.3/100,000. Together, there was a loss of 73782.7 DALYs. There were about 55 deaths calculated associated with AN [Table 1]. 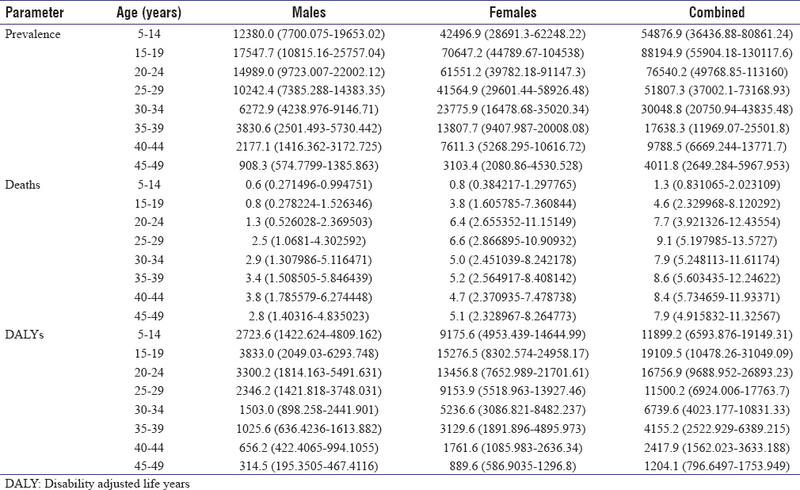 [Table 2] and [Table 3] show that the burden of the AN was borne by females in the age of 15–19 years than others [Figure 3]a and [Figure 3]b shows males and females. The prevalence rates appear to increase over the year from 1990 to current levels in 2016 [Figure 4]. The incidence model [Figure 5] and prevalence model [Figure 6]. The gender was the only fixed effect that affected the prevalence with β as − 1.65 (−1.99 to − 1.04) while exponentiated β that can be equated to odds ratio of 0.19 (0.14–0.35). For incidence, the β was − 1.35 (−1.97 to − 0.12) and odds ratio of 0.26 (0.14–0.89). 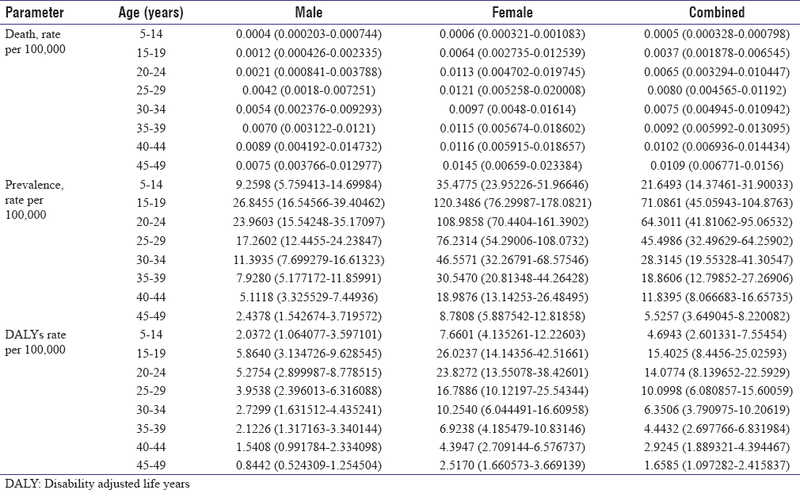 The relative risk difference between genders is shown in [Figure 7]. 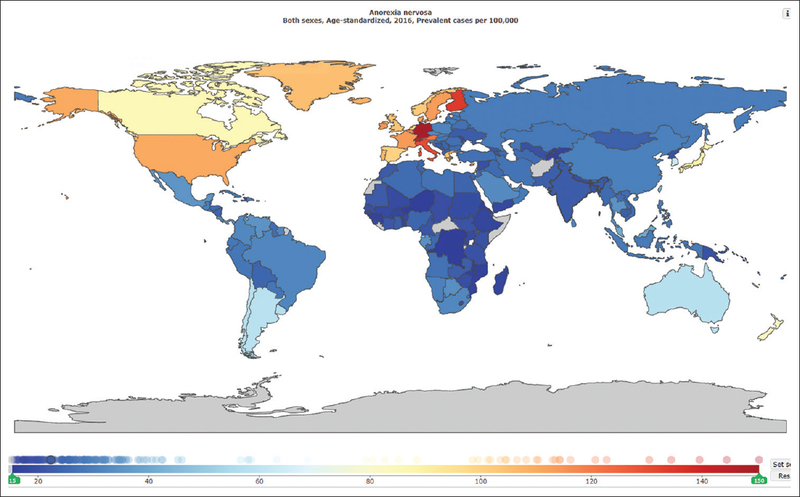 Relative risk (expressed as a rate ratio) is the mortality rate in AN compared to the mortality rate in the nondiseased population. The relative risk for males was 1.27 (1.22–1.35) whereas the female was 1.22 (1.18–1.28). The relative risk difference between genders is shown in [Figure 7]. Consequent to globalization, young Indian females are exposed to the “Western” concept of body imaging and fitness, especially through media. Mental health disorders such as AN need to be considered and interpreted in the context of cultural and social factors. Acute exposure to pro-fitness media instils a sense of dissatisfaction of body perception, thin-ideal internalization, and reduced self-esteem in young Indian females. Such abnormal thoughts may precipitate as abnormal eating behavior that later could evolve into ED and AN. In India, nonfat-phobic AN has been reported very similar to Hong Kong. Non-fat phobic variants lack the fat-phobia and distorted body image, which are hallmark of the “West” AN. In India, the prevalence studies of ED and AN began to emerge in the 1990s. However, like many Asian countries, AN or ED, till dates does not find a place in mental health/disorder screening programs, the latest being the Indian National Mental Health Survey. Much of the data from this survey was used by the GBD database. Available pertinent data from small-survey cohorts using questionnaires indicate that about half of the young females had symptoms of AN while 10% of them exhibits severe symptoms of AN. The impact of the body imaging and perception could be gauged by the extent of fitness and slimming industry. Fitness industry market reports from India indicate that slimming services occupy 17% and products occupy 12% of the entire fitness and slimming industry/services. This segment is reported to be worth of INR 100–115 billion in 2015. The industry is now expanding into tier II/III cities and rural areas. In a recent study, proxy markers of ED, as evidenced from the dental and oral cavity, indicates that possible prevalence of 42% of ED in the study population of young urban females. Grey literature from India postulates a higher prevalence of 10% among young Indian females while present study postulates a 0.12% in the same age group [Table 2] and [Table 3]. The difference could emanate from the methodology of the studies as well as the definitions employed. Furthermore, GBD data emanates from substitution and mathematical modeling while the Indian study is by questionnaire. The prevalence, DALYs and death epidemiological values are very similar to previous reports from the region. A previous GBD study comparing the mental disorders from India and China fails to account for the ED/AN in the region., This reveals the gap between ED and AN epidemiological research in the region. The gender difference in ED is one of the neglected areas of ED. Studies have reflected that men often do not report about eating behavior and a significant sub-sample of men suffer from ED and AN. The present study projects a female preponderance of 3.87 over males and the ratio increases beyond 4 in younger age group. The present study is probably the first of its kind to discuss the prevalence and burden of AN in India, to highlight the possible gender difference. Interestingly, though more females suffer from AN, the relative risk of mortality due to AN is higher for males than females [Figure 7], which warrants insights in future studies. There is no previous large-scale, peer-reviewed, published reports to corroborate the findings of this study. It can be safely assumed that the results of this study be a robust estimate of AN in India till more, structured research emanate. The results of the present study need to interpret with caution. With 3 lakh Indians, predominantly of younger age group estimated to suffer from AN, the policymakers and mental health professional needs to focus on AN research in this area, especially epidemiological and treatment modification to suit Indian needs. The literature discusses EDs and ANs in nonWestern societies based on the replication of “Western” concepts and always study the disorder through this change. The cultural change is often overlooked as seen as a result of western society influence rather than as a cause. The cause of this transformation is driven by the rapid industrialization, urbanization leading to shifts in population demographics, food supply, global economies, gender roles, and the traditional family structure. All these affect the way that the society sees and differ in eating habits the eating habit as well as the body structure idealization.,,, The heterogenic ED in India inclusive of nonfat phobic AN indicate that there could be more than one way how ED develop rather than being bound by culture. Indian psychiatrists needs to document the original research and publish their efforts in reputed journals. The lack of published evidence in the field of ED and other lesser known psychiatric illness acts as an impedance to frame appropriate policies. The documentation of documentation of epidemiological characteristics of various medical illness, including ED is the need of the hour., The present study also suffers from limitations such as a lack of data representativeness, data substitution, approximation caused by modeling and nonconsideration of local covariates except gender., India as a developing nation, has a substantially lower body mass index than global levels, non-consideration of nonfat phobic AN as a distinct entity, huge variance among population especially for regional, urban-rural divide that might influence the epidemiology of AN.,, Furthermore, screening using India specific questionnaires needs to be employed. Mathematical model estimation of AN in Indian population by gender, age by prevalence, death, DALYs have been presented. The study underlines the importance of a need to consider eating disorder in future nationwide mental health surveys. The present study could serve as a robust estimate to form structured, epidemiological studies in this direction. Consideration of several other covariates such as education, media influences, etc., also needs to be studied to combat the increasing menace of AN and other eating disorder in India. The authors would like to acknowledge the University of Washington and GLOBAL BURDEN OF DISEASES COLLOBORATORs. Pike KM, Dunne PE. The rise of eating disorders in Asia: A review. J Eat Disord 2015;3:33. Thomas JJ, Lee S, Becker AE. Updates in the epidemiology of eating disorders in Asia and the pacific. Curr Opin Psychiatry 2016;29:354-62. Khandelwal SK, Sharan P, Saxena S. Eating disorders: An Indian perspective. Int J Soc Psychiatry 1995;41:132-46. Mammen P, Russell S, Russell PS. Prevalence of eating disorders and psychiatric comorbidity among children and adolescents. Indian Pediatr 2007;44:357-9. Upadhyah A, Misra R, Parchwani D, Maheria P. Prevalence and risk factors for eating disorders in Indian adolescent females. Natl J Physiol Pharm Pharmacol 2014;4:153-7. Sebastian T, Nuzaiba A. Prevalence of anorexia nervosa among college girls in Ernakulam city, Kerala, India. Int J Adv Res 2014;2:508-17. Mallick N, Ray S, Mukhopadhyay S. Eating behaviours and body weight concerns among adolescent girls. Adv Public Health 2014;257396. doi: 10.1155/2014/257396. Available from: https://www.hindawi.com/journals/aph/2014/257396/. [Last accessed on 2018 Jun 01]. Chandra PS, Abbas S, Palmer R. Are eating disorders a significant clinical issue in urban India? A survey among psychiatrists in Bangalore. Int J Eat Disord 2012;45:443-6. Srinivasan TN, Suresh TR, Jayaram V, Fernandez MP. Eating disorder in India. Indian J Psychiatry 1995;37:26-30. Lal M, Abraham S, Parikh S, Chhibber K. A comparison of eating disorder patients in India and Australia. Indian J Psychiatry 2015;57:37-42. Srinivasa P, Chandrashekar M, Harish N, Gowda MR, Durgoji S. Case report on anorexia nervosa. Indian J Psychol Med 2015;37:236-8. Nagar I, Virk R. The struggle between the real and ideal: Impact of acute media exposure on body image of young Indian women. SAGE Open 2017;7. doi: 10.1177/2158244017691327. Available from: http://journals.sagepub.com/doi/pdf/10.1177/2158244017691327. [Last accessed on 2018 Jun 01]. Gururaj G, Varghese M, Benegal V, Rao GN, Pathak K, Singh LK, et al. National Mental Health Survey of India, 2015-16: Summary. 1st ed. Bengaluru: National Institute of Mental Health and Neuro Sciences, NIMHANS Publication; 90-109. American Psychiatric Association. Diagnostic and Statistical Manual of Mental Disorders (DSM-IVTR). 4th Text Revision ed. Washington DC: American Psychiatric Association; 2000. Kassebaum NJ, Smith AG, Bernabé E, Fleming TD, Reynolds AE, Vos T, et al. 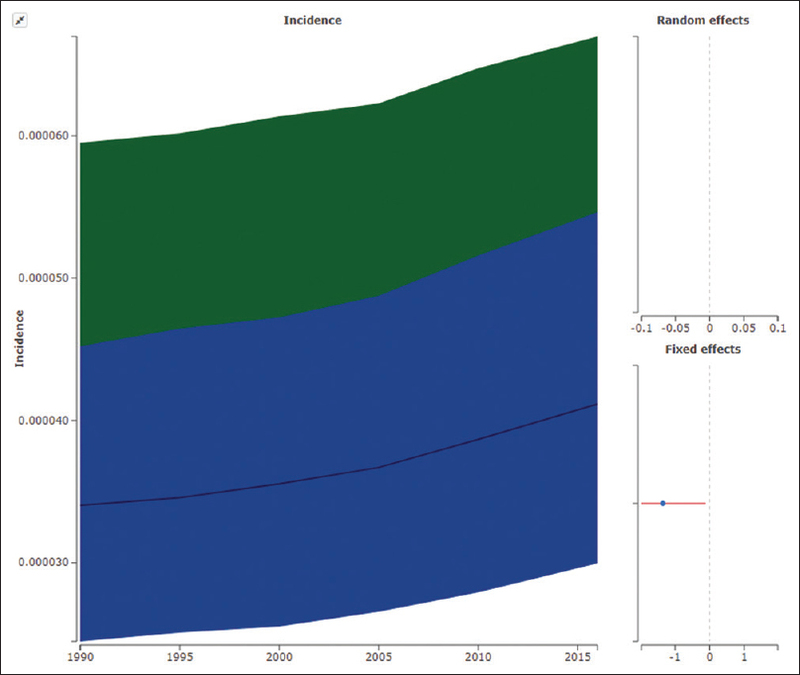 Global, regional, and national prevalence, incidence, and disability-adjusted life years for oral conditions for 195 countries, 1990-2015: A Systematic analysis for the global burden of diseases, injuries, and risk factors. J Dent Res 2017;96:380-7. Chhaabra N. Health and Fitness Industry– Indian Industry Analysis. Biz Research Labs. Available from: http://www.oysterconnect.com/sites/default/files/Health%20and%20Fitness%20Industry%20Analysis%20By%20Nikhil%20Chhabra.pdf. [Last accessed on 2017 Oct 01]. Jugale PV, Pramila M, Murthy AK, Rangath S. Oral manifestations of suspected eating disorders among women of 20-25 years in Bangalore city, India. J Health Popul Nutr 2014;32:46-50. Striegel-Moore RH, Rosselli F, Perrin N, DeBar L, Wilson GT, May A, et al. Gender difference in the prevalence of eating disorder symptoms. Int J Eat Disord 2009;42:471-4. Sengupta A, Angeli F, Syamala TS, Dagnelie PC, van Schayck CP. Overweight and obesity prevalence among Indian women by place of residence and socio-economic status: Contrasting patterns from 'underweight states' and 'overweight states' of India. Soc Sci Med 2015;138:161-9. Pradeepa R, Anjana RM, Joshi SR, Bhansali A, Deepa M, Joshi PP, et al. Prevalence of generalized & abdominal obesity in urban & rural India – The ICMR-INDIAB study (Phase-I) [ICMR – NDIAB-3]. Indian J Med Res 2015;142:139-50. Rashmi BM, Patil SS, Angadi MM, Pattankar TP. A cross-sectional study of the pattern of body image perception among female students of BBM College in Vijayapur, North Karnataka. J Clin Diagn Res 2016;10:LC05-9. Johnson AR, Balasubramanya B, Jaimol, Shaiby, Gifty, Britto RD. Body image perception and nutritional status of adolescents in a school in rural South India. J Indian Assoc Child Adolesc Ment Health 2015;11:260-78. Mohandoss AA, Thavarajah R. Contribution of Indian psychiatrists to PubMed listed mental health literature during 1995-2013: An exploratory study. Indian J Psychol Med 2016;38:302-8. Mohandoss AA, Thavarajah R. Contribution and performance of Indian psychiatrists and a pan-Indian psychiatry journal to mental health literature during 2010-14. J Scientometric Res 2016;5:100-5.